Drought-Stricken Cape Town Braces For Water To Run Out In April Officials in the South African city of 3.7 million are restricting water usage amid fears it will run out of water by April 21. Experts say the crisis has been exacerbated by rapid population growth. 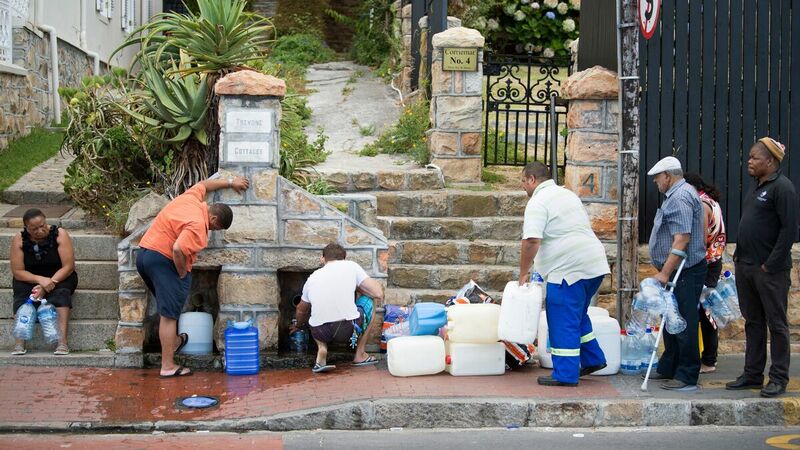 People collect drinking water from pipes fed by an underground spring last week in Cape Town. Next month, the city will slash its individual daily water consumption limit to 13.2 gallons, the mayor said, as the city battles its worst drought in a century. Starting Feb. 1, Cape Town will force residents to cut their water consumption to 13.2 gallons per day, down from 23 gallons. The city has already banned filling swimming pools and washing cars. Also in an October mandate, people were asked to take two-minute showers and limit use of appliances, such as dishwashers and washing machines, Pumza Fihlani, a BBC correspondent in Johannesburg, tells Here & Now's Robin Young. "For people that are used to the luxury that Cape Town promises, this has come across as a rather drastic measure," she says. "People are reusing some of the water that they've used in other areas and finding other uses for it around the household. This means limiting the amount of water you drink, limiting the showers that you take." City officials are blaming residents for ignoring previous water restrictions. Mayor Patricia de Lille said last week that more than 60 percent of residents are using too much water and threatened them with fines. "We can no longer ask people to stop wasting water. We must force them," the mayor told reporters. The mayor also announced the city moved "Day Zero" up a day because of the overuse of water. When Cape Town reaches "Day Zero," residents in the popular tourist city of 3.7 million will have to line up to collect 6.5 gallons of drinking water per person per day at some 200 distribution stations. Those restrictions adhere to the World Health Organization's guidelines for the minimum amount of water needed in emergencies. But other experts say city planners failed to anticipate that the city's six dams, which are sourced by rainfall, would run out of water as drought worsened and the population grew, Fihlani says. Dam levels have dropped to 15.2 percent capacity of usable water, down from 77 percent in Sept. 2015, according to The Los Angeles Times. "Not enough dams have been built over the time that the population has grown and infrastructure has remained the same and that's why the city now finds itself in the position that it's in," she says. Western Cape Premier Helen Zille and provincial authorities have accused the national African National Congress government of failing to build and maintain new infrastructure and send adequate emergency drought relief. It was not until August that the national government allocated the city $1.5 million to deal with the crisis. Prior to tightening water measures, the city attempted to shame residents into using less water by posting an online map tracking water consumption across the city. Cape Town has also tried to reduce water usage by weakening the water pressure and installing water management devices, according to Reuters. Desalination projects and new efforts to extract groundwater are still in the early stages, Fihlani says. "A number of these projects need money," she says, "and it's not clear that the city will have enough time to raise the money that they need to fund these rather ambitious projects."